Snow forecasts are better than they used to be and they continue to improve, but snow forecasting remains a difficult challenge for meteorologists. One reason is that during intense snows, the heaviest snowfall can occur in surprisingly narrow bands, and on a smaller scale than observing networks and forecast zones can see. Also, the extremely small temperature differences that define the boundary line between rain and snow make large differences in snow forecasts. This is part of the fun and frustration that makes snow forecasting so interesting. 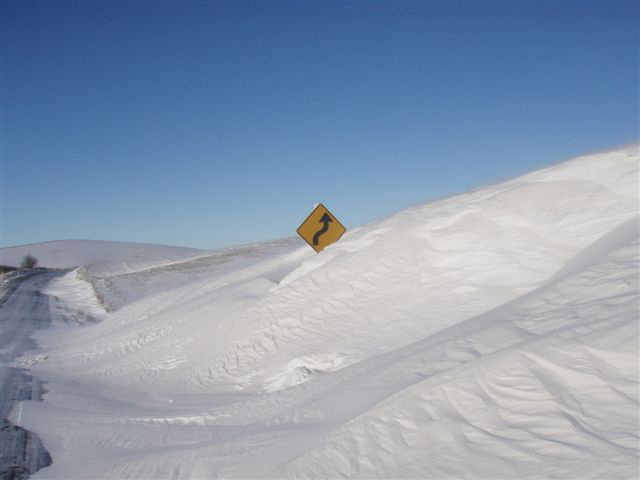 These drifts along Washington State Route 27 were so high that they nearly obscured traffic signs after a January 2008 snowfall. 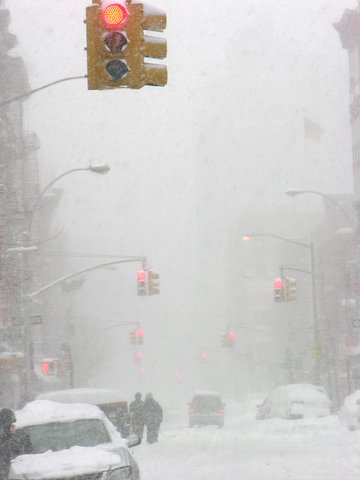 Blizzard conditions during a December 2008 storm in Fargo, North Dakota, made travel dangerous. Authorities closed Interstate 29, a major route across the state. Because conditions in the atmosphere and on the ground can vary, each storm might produce a different type of snowfall. In addition, snow does not fall evenly everywhere. Even during the same storm, one neighborhood may receive deep snow, while an adjacent neighborhood may only receive a light dusting. At the local scale, variations in snow depth are caused primarily by wind during and after the storm, and by melting after the storm. At the larger scale, say across an entire state, it also depends on the storm track. Places in the middle of the storm track may receive significant snowfall, while locations along the edges of the storm may receive much less. A snow flurry refers to light showers of snow that do not cover large areas and do not fall steadily for long periods of time. Freezing rain is precipitation that cools below 0 degrees Celsius (32 degrees Fahrenheit), but does not turn to ice in the air. The water is supercooled. When the drops hit anything they instantly turn into ice. An ice storm is a storm with large amounts of freezing rain that coats trees, power lines and roadways with ice. 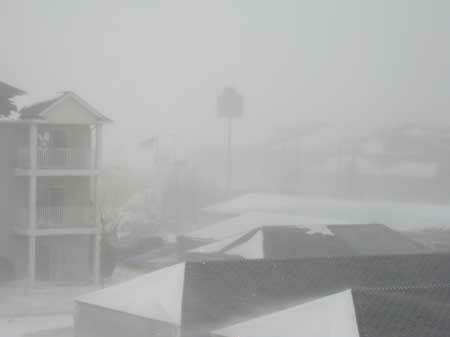 A blizzard is a severe winter storm that packs a combination of snow and wind, resulting in very low visibility. Officially, the National Weather Service defines a blizzard as large amounts of falling or blowing snow with winds in excess of 56 kilometers (35 miles) per hour and visibilities of less than 0.40 kilometers (0.25 miles) for more than 3 hours. While heavy snowfall and severe cold often accompany blizzards, they are not required. Sometimes strong winds pick up snow that has already fallen, creating a ground blizzard. A Winter Weather Advisory is issued for accumulations of snow, freezing rain, freezing drizzle, and sleet that may present a hazard but does not merit a warning. A Winter Storm Watch is issued to alert the public to the possibility of a blizzard, heavy snow, heavy freezing rain, or heavy sleet. A Winter Storm Warning is issued when a hazardous winter weather event is imminent or occurring, and is considered a threat to life and property. The rumbling sound in this short video is thundersnow, which occurred during a blizzard in Madison, Wisconsin. Blizzards can create a variety of dangerous conditions. Traveling by automobile can become difficult or even impossible due to whiteout conditions and drifting snow. The strong winds and low temperatures accompanying blizzards can combine to create other dangers. For instance, the windchill factor is the amount of cooling one feels due to the combination of wind and temperature. A strong wind combined with a temperature of just below freezing can have the same effect as a still air temperature about 35 degrees colder. A windchill chart may be used to estimate the windchill factor. Exposure to low windchill values can result in frostbite or hypothermia. Frostbite is a severe reaction to cold exposure that can permanently damage its victim. Hypothermia is a condition brought on when the body temperature drops dangerously low, and can be fatal if not caught in time. Blizzards also often cause related problems. Strong winds and heavy snow can damage cause tree limbs to fall onto structures or even utility lines, resulting in power outages. Drifts can block roads and sidewalks and make traveling difficult well after the storm is over. Although snowstorms typically occur in the winter, and thunderstorms typically occur during the summer, there are rare instances when meteorological conditions produce a phenomenon called thunder snow. In these instances, temperatures are low enough to generate snow instead of rain, and turbulence in the atmosphere causes the lighting and thunder.